I’m trying to create a world in my films. Jacques Demy’s films inhabit worlds in themselves—personal and imaginary worlds, self-contained and organic. Demy’s legacy may lack consistent quality, but not consistent personal vision: while his contemporaries abandoned poetry for politics, Demy remained faithful to the romanticism of his boyhood projects. His fairy tale themes, his flair with light, color and music, and his wistful, innocent tone comprise a powerful signature style, and several spectacles from his films resound today as quintessentially “Demy”. His resonant personal vision should alone justify his inclusion among the “auteurs”, at least in its simplest sense, defined by Andrew Sarris as a director with a salient visual style. (2) Yet while Demy enjoyed early critical acclaim, he fell from fashion in the wake of May ’68, as French critics increasingly berated him as apolitical and Americans like Pauline Kael grew to label him a naïve idol of American genre. These receptions underestimate Demy, who deserves a second look towards inclusion in the great directors pantheon. However simplistic or kitschy his spectacles may appear today, they do share layers of intertext and nuance, and however naïve his stories, they do yield a freshness and optimism that endured long after the erosion of the New Wave. 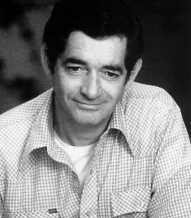 Born in Pontchâteau, on France’s Atlantic coast, in 1931, Jacques Demy enjoyed a playful childhood in Nantes, where he directed animated and live-action shorts and studied fine arts. After training with the famed animator Paul Grimault, he assisted the documentarian Georges Rouquier, with whom he produced his first documentary short, Le Sabotier du Val de Loire, in 1955. His first feature, Lola (1961), captivated Jean-Luc Godard in Cahiers du cinéma and ushered him into the fringes of the New Wave. He followed with a charming chapter, “La Luxure” (“Lust”), for Les Sept péchés capitaux (The Seven Deadly Sins, 1961), adding to segments by Godard, Roger Vadim, and Claude Chabrol, and his second feature, La Baie des Anges (Bay of Angels, 1962), a gambling melodrama starring Jeanne Moreau and Claude Mann. In 1962, Demy married the filmmaker Agnès Varda, which solidified his affiliations with a group of directors known as the “Left Bank”. The Left Bank—Varda, Chris Marker, Alain Resnais, and Alain Robbe-Grillet—identified themselves this way for their Paris neighborhood as well as for their leftist persuasion. The group distinguished themselves through political content from the aesthetically focused New Wave. Since Lola, Demy had been cultivating a project for an experimental musical, “a film entirely sung”. (3) Les Parapluies de Cherbourg (The Umbrellas of Cherbourg, 1964) continued the path of the Lola protagonist Roland Cassard, but in a completely new form, all of its dialogue set to composer Michel Legrand’s music. 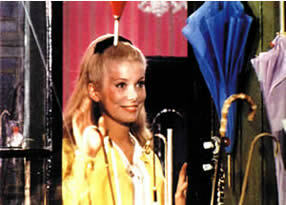 Les Parapluies, with its color, spectacle, and melodrama, featured an unknown Catherine Deneuve and opened to wide critical acclaim. Demy took this musical experiment further with Les Demoiselles de Rochefort (The Young Girls of Rochefort, 1967), another Legrand musical, starring Deneuve, her sister Françoise Dorléac, George Chakiris, and Gene Kelly, who also choreographed the film’s dance sequences. While Les Parapluies had ventured into new territory as a quotidian opera, Rochefort alternated music and spoken dialogue, in the tradition of American musical comedy. Critics in France and abroad criticised Demy for replacing substance with spectacle. In 1967, Demy landed a contract with Columbia Pictures, and he and Varda left for Hollywood. There, he filmed Model Shop (1969), completing the Lola story by following his earliest heroine to Los Angeles. Perhaps clouded by his new Hollywood sensibility, Demy struggled upon his return to France. He maintained some of his earlier magic with the fairy tale Peau d’âne (Donkey Skin, 1970), another Deneuve vehicle and an homage to Jean Cocteau. Yet his British Pied Piper (1971), met little success, and his first feature comedy, L’Événément le plus important depuis que l’homme a marché sur la lune (A Slightly Pregnant Man, 1973), bombed at the box office, despite the presence of Deneuve and Marcello Mastroianni. Demy responded by again retreating from French cinema, this time for nine years. During this period, Demy restricted himself to the Japanese Lady Oscar (1978), filmed in English, while a proposal to film in the Soviet Union fell through. In 1980, Demy directed one French telefilm of a Colette novel, La Naissance du jour, but his slump continued, and he and Varda parted ways. When Varda returned, only the following year, Demy had plunged back into French cinema for Une Chambre en ville (A Room in Town, 1982). This film revived the spirit of Les Parapluies, as an opera-melodrama set against a labor strike, set to a score by Michel Colombier. Une Chambre en ville failed financially but received nearly unanimous critical acclaim and led to a lifetime achievement award, the Grand Prix des Arts et Lettres, later that year. (4) Next, Demy played tribute to Cocteau’s Orphée in Parking (1985), he rejoined Grimault for the animated and live-action mix La Table tournante (1988), and he completed a final musical, Trois places pour le 26 (Three Places for the 26th, 1988), with Yves Montand. Demy contributed interviews for Varda’s Jacquot de Nantes (Jacquot, 1991), a biographical feature on his boyhood dreams and film projects, but he died of leukemia in October, 1990, shortly before the film’s release. Again, if Demy’s career lacks consistency, this results more from an inconsistency of quality than from any lack of personal vision. In the words of critic Terrence Rafferty, Demy aimed “to seduce, not to challenge” or, in his own words, to disguise reality, “masking pessimism”. (5) For each film, Demy constructed an elaborate mise-en-scène as a world into itself, shooting on location but transforming the landscape into a magical realm. For Lola, Demy worked with cinematographer Raoul Coutard to enhance the gleaming sunlight of Nantes’ ports; for La Baie des Anges, he used Jean Rabier’s sweeping widescreen to exaggerate the vistas of Nice. In Les Parapluies, Demy sought to create “a mixture of poetry, color and music”. (6) Accordingly, he ordered his crew to repaint entire blocks of houses, making over Cherbourg into a symphony of vibrant primaries and pastels, depending on the season. Color film had yet to become popular among the New Wave and the Left Bank, but Demy embraced the Eastmancolor range, spilling stylised color onto Jacqueline Moreau’s costumes and Bernard Evein’s sets. (7) For Rochefort, he added brilliant white to this palette to imitate the seaside sun. Not only did Demy construct imaginary worlds in each film’s mise-en-scène; he also clung to themes of childhood reverie, a quality of wistfulness. While the New Wave tended towards Brechtian roughness and the Left Bank veered towards realism or philosophical ambiguity, Demy, in a sense, never grew up. Even “La Luxure” frames its fleeting sexual images through the eyes of a “pure and innocent” schoolboy. Perhaps inspired by Demy himself, this boy confuses “lechery” with “luxury”, and not even his parents know what the word really means. This humor of innocence, prevalent throughout his career, tempts critics to liken Demy to a naïf, but doing so hints that he was something of a folk artist. In fact, Demy worked with a sophisticated cinematic literacy, even drawing his dreamy quality from Cocteau and the surrealists. Demy met an uneven critical response in France. The Cahiers crowd, particularly Godard, praised the poetics of his early films. Godard included Lola in his Top Ten List of 1961 and praised Demy’s cultural literacy, which he found rare among their generation of filmmakers. (8) Indeed, Lola contains rich moments of intertextuality, from its title, evoking the heroines of Max Ophüls’ Lola Montès (1955) and Josef von Sternberg’s The Blue Angel (1930), to its visual quotes of Robert Bresson and Gary Cooper. (9) Godard and the New Wave embraced such intertextual reference and subjected it to endless refraction. Godard directly lifted portions of Lola‘s story and dialogue for Une Femme est une femme (A Woman is a Woman, 1961), premiering six months after Demy’s film, (10) and his Bande à part (Band of Outsiders, 1964), released a few months after Les Parapluies, contained a jukebox tribute to Legrand’s theme. Demy, for his part, referenced Truffaut in Les Desmoiselles de Rochefort, having sisters Delphine and Solange mock their Mutt and Jeff suitors as “Jules et Jim”. Yes, Demy’s films lack political conviction, particularly when compared to those of Varda, the Left Bank, and Godard of the late ’60s. Yet Demy did not ignore international contexts and social realities; he merely subjugated them to their imprints on his characters’ personal lives. His first documentary, Le Sabotier du Val de Loire, explores the aftermath of World War II, but in an indirect manner, through the quotidian rituals of a simple seaside family. (15) Les Parapluies frames its romance against the war in Algeria, but this remains mainly a backdrop to the lives of the young lovers. In Rochefort, Demy refers to foreign locales, but only insofar as its characters daydream of faraway paradises, Paris, Hamburg, and New York. Likewise, Demy did address social realities, but through his romantic, rose-colored lens, glossing over the difficult themes of prostitution in Lola, gambling in La Baie des Anges, and labor revolts in Une Chambre en ville. Demy persisted in innocence, even through his ties to the Left Bank and to his and Varda’s left-leaning crowd in California, of which Jim Morrison was a member, remained. While Varda produced documentary manifestoes Salut les Cubains (1963), Loin du Vietnam (1967) and Black Panthers (1968), Demy eschewed films with explicit political agendas. Demy also found a fickle reception in the U.S. Andrew Sarris called La Baie des Anges “a piece of cinematic vaudeville”, (16) while Pauline Kael called it a “magical, whirling little film…almost an emanation of Moreau.” (17) Kael also confided that she found Les Parapluies “lovely…original and fine…One of the sad things about our times, I think, is that so many people find a romantic movie like [Parapluies] frivolous and negligible.” (18) Yet at Rochefort‘s release, Kael thumbed her nose at what she saw as clumsy imitation of an American tradition, demonstrating “how even a gifted Frenchman who adores American musicals misunderstands their conventions.” (19) For Kael, this film exploited the aesthetics of lightness akin to Roland Barthes’ mythic “Frenchicity”, and it offered allure only to naïve Americans enraptured by a charm they considered typically French. (20) It is true that Rochefort‘s breeziness offered romanticised escapism in the manner of Hollywood spectacles set in Paris like An American in Paris (Vincente Minnelli, 1951), Funny Face (Stanley Donen, 1957) and Gigi (Vincente Minnelli, 1958). For his part, Demy insisted that he never intended to rip off American genre. On the contrary, he argued, he had sought to create a new musical form, one owing “nothing to American musical comedy” and nothing to French operetta. (21) His films, in fact, suggest an ambivalence towards American culture, not unabashed adoration. Rochefort celebrates American icons in references to Louis Armstrong, Count Basie, and Lionel Hampton and in the presence of Gene Kelly, but Kelly’s character, the musician Andrew Miller, embodies a trifle of the ugly American. (22) Kelly has returned to France from the U.S., where he sought “fame and fortune” and his feeble French cannot separate him from the throngs of American tourists, who are, as Delphine notes, the only foreigners in town. Great director, naïf, or both? While Varda’s celebrity has undoubtedly aided Demy’s career, it may also have contributed to Demy’s critical underestimation. 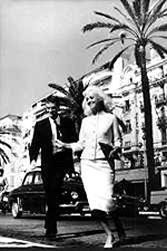 Aside from Jacquot, Demy and Varda always maintained “a working partnership only in the loosest sense”. (24) Yet they did influence each other’s working methods and styles. In particular, Varda’s Le Bonheur (Happiness, 1964) shares vibrant color with Les Parapluies, and her campy Legrand numbers in Cléo de 5 à 7 (1961) prelude Demy’s musicals. Varda continues to shape Demy’s legacy, overseeing the restorations of his films and releasing Jacquot and the documentaries Les Demoiselles ont eu 25 ans (The Young Girls Turn 25, 1992) and L’Univers de Jacques Demy (The World of Jacques Demy, 1995) . Still, might it be that Demy’s films appear more simplistic and artificial when placed alongside Varda’s? However undemanding and lollipop Demy’s films may appear, they present some nuance and sophisticated intertext, and they share a certain charm, vivid and unified. His films inhabit worlds in themselves that may peripherally refer to social reality and the real world but remain content as alternate realities of poetry, color, and music. Several links to online articles can be found here. Michael Atkinson’s review of the 2001 re-release of La Baie des Anges from The Village Voice. Terrence Rafferty’s review of Lola and La Baie des Anges from The New York Times, 2001. Site on the film, from the town’s official site. As outlined by Sarris in his 1962 essay “Notes on the Auteur Theory” and expanded in his book, The American Cinema: Directors and Directions 1929–1968, Dutton, New York, 1968. Granted, Sarris’s essay draws from a misunderstanding of François Truffaut’s essay “Une certaine tendance du cinéma français” published in Cahiers du cinéma, No. 31, 1954. Godard had been praising American “Warnercolor” since the late ’50s and had filmed Une Femme est une femme in color in 1961, but Demy’s film preceded the 1964 Godard’s interview with Michelangelo Antonioni that some historians mark as “the pivotal moment in art cinema’s transition to color”, corresponding with Antonioni’s film Il deserto rosso (1964). See Richard Neupert, A History of the French New Wave Cinema, University of Wisconsin Press, 2002, p. 232. For Une Femme est une femme, Godard also used Lola‘s director of photographer, Raoul Coutard. Kelly’s choreography maintains a quintessential urban American vibe, enhanced by the presence of West Side Story‘s George Chakiris. Caroline E. Layde, a Cinema graduate of New York University, has worked at the Metropolitan Museum of Art and the Whitney Museum in New York. She now writes in Milwaukee, U.S.A.